A day before Valentine’s day, I thought I should show you what I have been preparing in the past few days for my Valentine. As you might know, we both enjoy playing video games, especially the famous Overwatch! I have printed out some heroes art and some famous quotes, and I though this might give you an idea of how to surprise your loved one if they love playing video games! Thanks to the Instagram Post from @dragonofdawn, I have found out these lovely printables below. And thanks to my favorite Facebook Overwatch Fan Page – OverMeme – Overwatch Memes, I have found out those cutsies! How do you plan or surprising your loved one for Valentine’s day? Do you play video games, and what is your favorite game? Life is full of ups and downs. And I never knew I would be the one to get hit that hard. Life hit me hard – right in the chest, where it hurts the most. I was sailing with my little boat on those not very calm waters, and I found myself between two little islands. Two lovely islands, both of them, with promising future ahead of them. Both of them unconditionally welcoming me on board. Both of them smiling at me through the sunset reflection in the sea. When sunset comes, I knew those islands were different. One was warm and loving, fields full of calmness and wisdom. One was tough and rough, with deep blue lakes full of troubles. One made me feel settled. The other one made me feel alive. I was so close to the first island. I could almost see the comfort from my boat. I could see the welcoming branches from the trees waving at me. It was nice to know someone wants me there. But when I looked on the other side, I saw the deep lakes on the other island, and I knew how dangerous they were. But yet, something about that danger pulled me towards it. I didn’t know whether it would be worth it, but I decided I’ll turn around and see what this island has to offer me. I turned the boat around, and as soon as I did it, a huge storm hit me and my boat. My boat snapped, and I was alone in the cold waters, swimming on my own towards the new island full of troubles. I was left to cope with my troubles alone, on my own, in the deep sea waters. After an eternity, I finally made it! I was there, on the island. I wasn’t welcomed like I would expect, but I had a shelter – a little house made from branches. The island had troubles of its own, coping with his own demons, leaving me and my sadness alone. Never trying to help me – thinking I could help myself. At this point, I lost everything I’ve ever had, everything I’ve ever loved, and I found a shelter. I even found warmth in the coldness of this little troubled island. But the island was right – I did help myself. Not knowingly – yet I did. I started building a new boat – bigger, and gaining resources in order to survive. I did all of that. After a while – the island started showing me its hidden mysteries. I discovered places and caves about this island that I never knew existed. He showed me even those deep lakes, that I was so afraid to touch. But there I was, witnessing the warmth of this island, even though he’ll never admit it happened. The island would whisper to me the most sad stories of its existence, how people lived here, and he lost them. How pirates would come and steal what he’s got. How he’d even throw away the person that stayed on his island for a while, just so he would have the capability to provide a shelter for me to live on this island now. Thinking I’d only find trouble, but wanting to see what those deep lakes hide within themselves, I have found an island that can shelter me, warm me, help me survive, without him even knowing it. Leaving behind an island that promised me all the comfort and support, I have found an island that would care and love me without even wanting or trying to. I still miss my old boat though, I never wanted for it to crash. But sometimes, we break thing without meaning to. And sometimes, when we follow our heart and find special islands, there will be nobody to tell us they’re proud of us. But deep inside, I know they are. This month I’m announcing the start of summer. 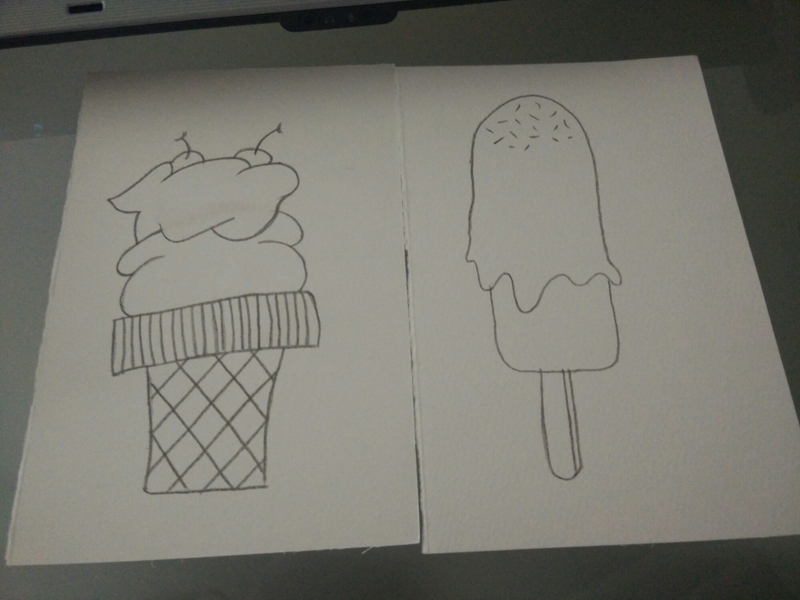 In England it doesn’t really seem like summer yet, so I’ll be drawing a lot of ice-creams for you guys. And the best thing is – you get to color them yourselves! How cool is that, eh? You can get one ice-cream card yourself here.